AgentRisk, a Los Angeles-based fintech company, founded by a team of ex-Splunk engineers has just released as an Open Beta the first A.I. Wealth Management Agent for high net worth individuals. A.I. is the missing link between human and robo-advisors. Imagine a future where you have immediate access to a superhuman, super fast, dedicated advisor 24/7, who is ready to react or even proact to market volatility as well as life changing events. AgentRisk has recognized the potential of engaging Artificial Intelligence in the active management of investment portfolios through dynamic risk adjustment and the use of option strategies. 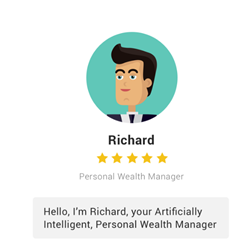 Richard, its Artificially Intelligent advisor, is designed to offer each client a tailored investment solution to help them reach their financial goals. Richard is constantly trained to identify changes in the clients’ risk tolerance and approach to investments and to update their portfolios accordingly, through an easy, hassle-free user experience. Thanks to the power of automation and two pending patents on Machine Learning and A.I., AgentRisk can provide services that up until now have never been available to the public, even to clients of premium wealth managers. All while offering full transparency, low, fixed fees and next-day money withdrawal. AgentRisk clients interested in participating in the Beta Program, can do so by sending an email to future@agentrisk.com.